Islamabad: With his accurate Chinese accent and precise pronunciation, young Pakistani student Tariq Aziz, surprised all — Chinese teachers, judges and fellow Pakistani students — at a Mandarin language proficiency event in Islamabad. “I chose to learn Chinese because this is the language of the future. I believe knowing Chinese will make me stand out and open up new opportunities,” Aziz said. Tariq Aziz has been learning Chinese for nearly a year at National University of Modern Languages (NUML) — Pakistan’s oldest foreign language institute. He is the winner of Chinese Proficiency Competition 2017 and will represent Pakistan at the final Chinese Bridge 2017 in China. Ni hao (Hello) or Zao shang hao (Good morning) is how the students greet each other in the class at NUML. At first, Tariq found the language a little challenging, but his perception changed soon. Sharing some tips for new learners, he said: “Chinese language is strange and bit difficult to grasp as there are no alphabets. New learners should focus on three key aspects of Pinyin [Romanised version of Chinese characters] which are: initials, finals, and tones” to master the language in less time. Aziz, 20, is one of the many Pakistani students who have been gripped by the Mandarin mania in the country. More Pakistanis are now learning Mandarin as they regard China as an all-weather and trusted friend of Pakistan and hope that learning the language will offer them a better understanding of their closest neighbour and one of the richest cultures in the world. Friendly bilateral relations built on mutual respect that go back 66 years are one of the main reasons that have spurred the interest in Chinese language, says Dr Anwar Mahmoud, head of Faculty of Languages at NUML. When the Chinese department at NUML was first opened in September 1970, there were only two Chinese teachers and 13 students. This number has now swelled to dozens of teachers and almost 1,000 students, according to the department. This year alone, 460 students have been admitted into the programme. Cultural exchange programmes and celebrations to mark the Chinese New Year festival in Pakistan have also instilled the love of the language in recent years. Traditionally, the United States, Australia and Europe were the top choices for overseas study for affluent Pakistanis. But the trend has of late been changing with China becoming a more favourable destination given tough visa restrictions and education requirements in Europe. The growing Pakistan-China cultural relations, economic cooperation, and presence of Chinese companies in Pakistan has inspired Pakistani students to look towards China. With almost 19,000 students in China in 2016, Pakistanis are now among the 4th largest foreign students community in China, according to Chinese Ministry of Education statistics. This year, some 5,081 students received Chinese government scholarship whereas others are studying at their own expense. Mohammad Ahsan started learning basic Chinese in Islamabad before heading to the Renmin University in Beijing for further studies. Most Pakistani youngsters believe that learning Chinese will be an asset for their personal and professional growth. China’s breathtaking economic development and the China-Pakistan Economic Corridor (CPEC) has prompted the Chinese language obsession in all regions of the country, from Karachi to Lahore to Faisalabad, or from Islamabad and Peshawar to Gilgit-Baltistan. “Young Pakistanis want to attain the benefits of the economic corridor by being part of it through education, business and language,” explains Rukhsana Hassan, senior Chinese language teacher. “Once there was the English language craze in Pakistan. Now we are witnessing a Chinese fever here,” she said. “Students know that learning Mandarin will guide them towards a rewarding career as translator, counsellor or manager,” Hassan told Gulf News. 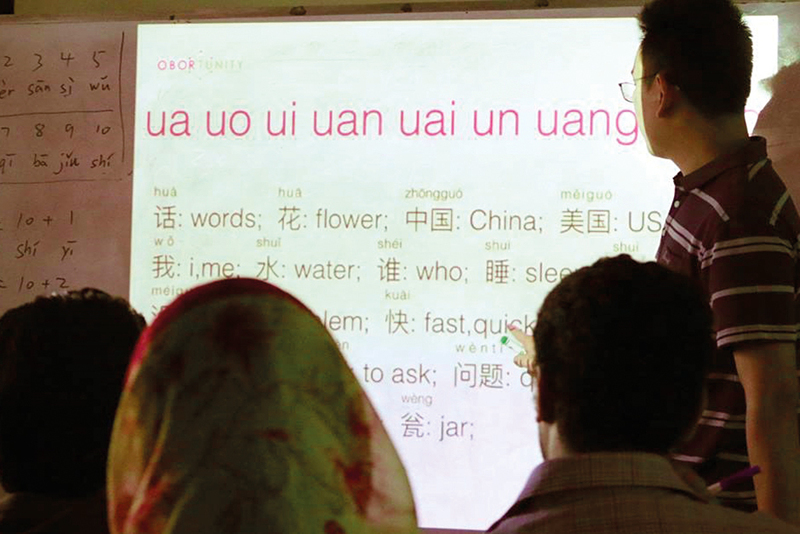 The growing interest in the language has led to some Mandarin centres mushrooming in Pakistan’s major cities. In Islamabad alone, many prominent schools and institutes including NUST, COMSATS, Headstart School, City School, Beaconhouse School and Roots School are teaching Chinese language. The $62 billion (Dh227.67 billion) China Pakistan Economic Corridor (CPEC) is a big factor, says Ma Xu, Chinese language teacher at Confucius Institute. “CPEC is not only focused on economic ties but also cultural, social, educational ties. People-to-people linkages, cultural caravans, scholarship and job opportunities are the reasons why Pakistanis are now inclined to learn Chinese language,” he says. But each student has different aspirations. The 21-year-old Mariam Khalid says that she is taking Mandarin classes as she wants to pursue a Masters degree in China. Mansour Khan, a student at the Obortunity institute for Chinese language, says that the language as helped him grow professionally. The other benefit of speaking Chinese, he reveals, is that you stand to get some special discounts while shopping. “When I talk to them in Chinese, they are so amazed that they offer me amazing big discounts,” he said unable to hide a smile. The majority of the students in Obortunity’s Mandarin class are businessmen or professionals working in fields where they have plenty of interaction with the Chinese. “These specially designed short courses helped me pick up Chinese quickly. I was able to start interacting with Chinese people at my company after two classes,” explains Anum Javed. The Chinese language has also fascinated the media industry in Pakistan. In May 2017, the first-ever Chinese language weekly newspaper ‘Guashang’ was launched in Pakistan along with its English version. The newspaper which has its head office located in Islamabad is aimed at the Chinese community in Pakistan. “There are some 400,000 Chinese nationals living in Pakistan and around 25,000 of them reside in Islamabad. This newspaper is a big hit among Chinese as well as Pakistanis,” according to Arsalan Raz, a staff member at the newspaper. Cultural, educational exchanges and the CPEC project, are strengthening overall bilateral relations but Mandarin is the key that will hold the hearts of the two countries together.